The Seattle Minimum Wage Increase: Disaster or Not? Dark warnings were voiced in the wake of the passage of the minimum wage ordinance. “Seattle’s Minimum-Wage Hike Is Sure to End in Disaster”. “Seattle sees fallout from $15 minimum wage” In an early — and widely debunked — assessment, Mark J. Perry writes “New evidence suggests that Seattle’s ‘radical experiment’ might be a model for the rest of the nation not to follow”. I think it a good idea to first place into context the “$15 minimum wage”. It’s being phased in over time, and does not apply equally to all firms. Figure 1 depicts the Seattle minimum wage, over a long time span, differentiating the Schedule 1 rate (for firms over 500 employees) from Schedule 2 (less than 500). Figure 1: Minimum wage per hour in Seattle (blue), and for Schedule 1 (dark blue) and for Schedule 2 (light blue), and Federal (red). Source: BLS, and City of Seattle. There does seem to be an alarmingly steep ascent in the minimum wage, particularly when focusing on the rate for large firms. Of course, these are nominal rates. Real rates paint a somewhat different picture. Figure 2: Real minimum wage per hour in Seattle (blue), and for Schedule 1 (dark blue) and for Schedule 2 (light blue), and actual Federal (red), and projected Federal (dark red), on log scale. Deflated using CPI-all for US, and n.s.a. CPI for Seattle; assumes projected inflation trends at the 2009M06-2016M05 rate, and no changes in the Federal minimum wage; assumes price level in Seattle is 21.3% higher than national in 2010. Source: BLS, and City of Seattle, BLS via FRED, City of Seattle, Forbes, and author’s calculations. Note that once on adjusts for inflation, the Seattle real minimum wage is only slightly higher than that recorded in the late 1960’s. Further, when adjusting — admittedly in a crude fashion — for the higher cost of living in Seattle, the Schedule 2 (small firms, with less than 500 employees) minimum wage is not particularly high, in a national context. This paper provides an overview of Seattle’s 2014 ordinance mandating a gradual increase to a $15 minimum wage. It then outlines a research agenda for a comprehensive evaluation of the effects of this ordinance, to be executed concurrently with the phase-in period. The evaluation is using original data on area prices, and on employer and worker perspectives, as well as secondary survey and state administrative data. This paper presents results from a series of investigations of consumer prices, including intensive field collection from grocery stores and small businesses. Most investigations use difference-in-difference methodology comparing trends in Seattle to those in nearby jurisdictions. Results show no statistically significant impact of Seattle’s initial increase to an $11 minimum wage on consumer prices, though estimates are imprecise enough to be consistent with the small positive effects observed in other studies and suggestive of a more concentrated impact in the restaurant industry. This entry was posted on July 11, 2016 by Menzie Chinn. Someone who truly cares about the little guy would propose a minimum wage law that takes effect 12/31/2016. Straight up to $20 an hour. Then we can have a true experiment of whether or not the minimum wage costs jobs or not. Gradual increases over time only buries the effect among the thousands of other variables that impact labor markets. Of course that is a feature not a bug, given that generally speaking those thousands of other variables are in aggregate positive for job growth over time. Why don’t you be honest and just say the hell with experiments, I want a $20 minimum wage? why not have a minimum wage tied to inflation? Do you know the optimal real minimum wage – whether it’s too high or too low – before tying it to inflation? If national real income rises or falls, should the real minimum wage be the same – too low or too high? i can guarantee a minimum wage not tied to inflation is not at the optimal real minimum wage except for a short time in passing through such a point. and as long at the government defined minimum wage is less than the optimal, it should not matter. market forces should drive it up to such a value in that case. i highly doubt you could ever politically pass a minimum wage which ended up being above your desired optimal wage. So, you don’t know the optimal minimum wage, but assume the existing minimum wage is too low and you want to tie the existing minimum wage only to inflation. if i make the minimum wage below the optimum, and tie it to inflation, i produce a better outcome than you making the same minimum wage below the optimum and not tie it to inflation. you will make the bigger mistake in policy. and again, i do not think it is politically possible to enact a minimum wage above the optimum. but at least we both agree, a minimum wage is useful. So, you’re willing to accept a rigid and suboptimal real minimum wage, because you assume it’s too low and regardless of economic conditions. How do you know it’s better or optimal adjusting the minimum wage only to inflation? no. but if you define a minimum wage without a tie to inflation, you have accepted a rigid minimum wage. period. no room for correction. and unless we enter a period of deflation, it is guaranteed to become too low over time. this is the current practice. and as we have seen, legislators have not been very concerned about updating it themselves. linking it to inflation minimizes the detrimental effects of such political delays. should changes to the minimum wage be tied to which political party is in power? You even disagree with yourself. I’m not the one who wants to lock in the real minimum wage, regardless of economic conditions and at a suboptimal rate. i have no problem defining a wage and linking it to inflation. if over time, we see that it is not a good number, the legislators can always adjust the wage. we do that today. the difference is that in between the legislative changes, the wage will better move with inflation. in your approach, it will never move. so over time, the minimum wage will always be increasingly below the optimum. your approach is locking in a suboptimum wage. over time your wage simply becomes a bigger mistake. why would you want your mistakes to grow over time, when you can minimize that particular mistake? Inflation adjusts the real minimum wage. Policy makers can adjust the real minimum wage by raising the nominal minimum wage (do you think they will or can actually lower the nominal minimum wage?). You want to take away policy maker’s flexibility by setting the minimum wage in stone. no. they are always welcome to change the minimum wage if they feel it is appropriate. we apply a correction once a decade or so as it is. it is not set in stone. that is a false argument. but why not correct it yearly? look at figure 2, the federal real minimum wage drops all the time. so you think the time period from 98-06 had economic conditions which required those working the minimum wage to need a pay cut to support the economy? you are arguing foolish economics. You disagree with my statement and then show it’s correct. Right, the minimum wage is more flexible when it’s not set to inflation and policy makers have more flexibility. And, I have nothing to do with “arguing foolish economics.” You’re just arguing with yourself. apparently federal policy makers do not utilize such flexibility. 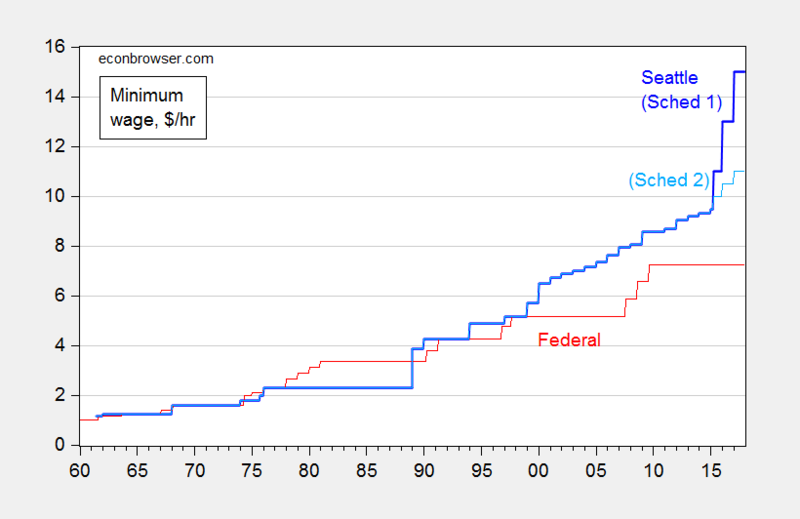 in figure 2, it is very clear the real federal minimum wage constantly decreases after each reset. hence your position supports the idea of a pay cut for minimum wage workers. if policy sets a minimum wage in year one, and then allows the real minimum wage to decrease each year thereafter, it defeats the purpose of a minimum wage to begin with. at least seattle maintained a consistent real minimum wage. that is good policy. you argue foolish economics when you advocate a policy that produces drops in real minimum wages each year. you essentially mandate a pay cut for a large class of workers, each and every year. What if people want employers to pay for more regulations? Can they afford the wages too? I always wonder why those who believe increases crush employment don’t point out the boom in it as the rates are eroded away by inflation. Oh, that’s right, it’s because it doesn’t happen. I recommend listening to this BBC Business Daily podcast (18 mins) interviewing both labor leaders and the Univ. of Washington economist tasked with tracking the results. I think a well-crafted law would exempt 16-22 year olds who are just entering the marketplace with little experience. If a high school drop out can’t get an unmandated wage before he/she is 23-years old, he/she will probably face a difficult time convincing a prospective employer to pay $15 per hour for a first job. The upside of a $15 minimum is inflationary pressure that the fed is seeking. The downside is that some large franchise restaurant chains, source of many early jobs, may move toward automation. I’m viewing this more as a goal than a promise by the Democrats. They have that. Gawker, HuffPo and other leftwing hypocrites demand higher minimum wage while they employee slave labor, excuse me unpaid interns. BTW go online and see what the evil big banks pay their interns. Much better than sweatshop journalism. Actually, in the federal minimum wage regulation there is a “training wage” exemption” where employers can pay teenagers a lower sub-minimum training wage for three months. Since the typical teenager barely remains in the same job for more than three months firms could employee teenagers at the sub-minimum wage and expect few of them to move up to the regular minimum wage — this is especially true for seasonal jobs. But hardly anyone ever bothers to use this. I do not know why, but It might make an interesting study for someone. Maybe it is because few know about it or they just figure it is not worth the bother. But at first glance firms not taking advantage of this sub-minimum wage implies that paying the minimum wage is no problem for most firms. Looking at those two figures, it appears that Seattle had much higher inflation than the average rest of the nation in the 60’s into the 80’s. Also, I don’t understand why there are big gaps in the data in Figure 2, while Figure 1 doesn’t have the gaps. 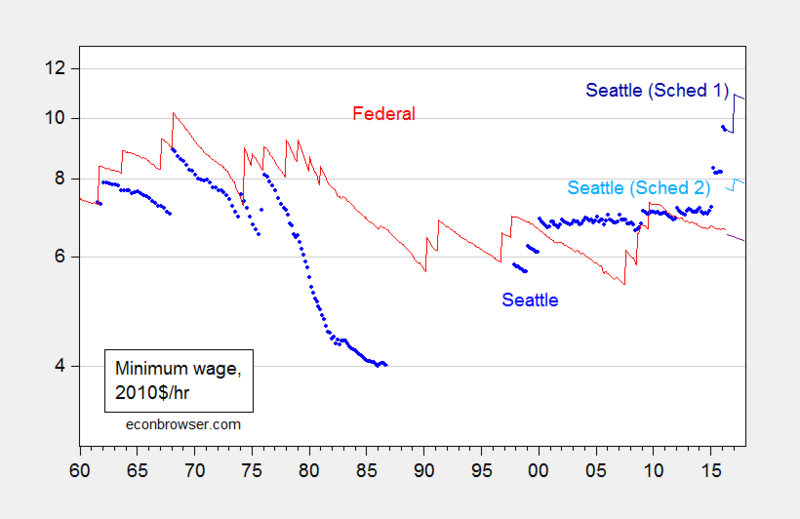 It seems like until the late 80’s the effective minimum wage in Seattle was nearly exactly equal to the federal minimum. Can you confirm and clarify? tew: No data collected for a separate Seattle CPI during the period for which there is a gap. In other words, we know what the Seattle minimum wage is, but not the Seattle CPI. MikeV: Yes, I know,that is the series I used. What I was saying was that there is a gap in the Seattle CPI so one can’t calculate the real minimum wage for several years. Menzie’s real genius is being able to actually find the data on the BLS website. I gave up after 10 minutes of clicking around. Of course the press release doesn’t even mention where the data are located on the site. I clicked around the Seattle-specific page and couldn’t find anything earlier than the early 90’s. tew It’s to save you the trouble that I put the links to the sources under the graphs — it’s listed under Figure 2 as City of Seattle. Mike, a little knowledge is a dangerous thing. If you had bothered to look at the CPI series you referenced you would have seen that the monthly data only goes back to 1998. From 1987 to 1998 that series is only available on an annual basis. Prior to 1998 it is quarterly data. On the page you linked to there is a box at the upper right that allows you to change the data span. If you look closely at the chart 2 shown above you will see little blue marks that show the annual data from 1987 to 1998. Unless, of course, Armageddon is a price spillover of one-half of one quarter for your Americano. From the trenches – I moved to the Seattle area about 4 months ago from Eugene, Oregon and started working as a manager in a hotel in Downtown Seattle. In the downtown the McDonalds on Westlake is advertising a starting wage of 13 bucks an hour in the window (the current minimum) and this sign has been up for 3 months. Many from one side of the aisle will say that the minimum wage is killing low wage service jobs in Seattle but in reality I think the sector is suffering from a labor supply problem and not a lack of demand. We churn through employees at the hotel and start at 14 bucks for entry level positions. Among other reasons, the labor supply is tied to the housing supply. Earning $14 and living within a reasonable commute time are mutually exclusive for very many in the Seattle region. Commute traffic is congested, mass transit is inadequate, and rent is high. Live farther out for lower rent, and the commute is intolerable (stand on a bus for an hour) or unaffordable (car plus downtown parking).